St. Martin's Griffin, 9780312375041, 368pp. Nine of today's hottest paranormal authors answer that question in this all-star collection of supernatural stories. 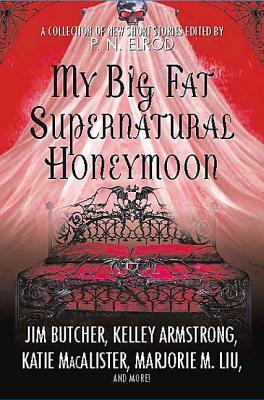 Can a vampire-hunter enjoy her honeymoon when she's just learned that her new hubby is a werewolf? How can newlyweds focus on their wedding night when their honeymoon suite is haunted by feuding ghosts? And what's a wizard to do when a gruesome monster kidnaps the bride on her way home from the wedding? P.N. Elrod is the editor of Dark and Stormy Knights, Strange Brew, My Big Fat Supernatural Honeymoon and My Big Fat Supernatural Wedding, which won the 2006 Pearl Award for best anthology. She is the author of many novels, including the Vampire Files Series, as well as numerous short stories. In 2010, she was nominated for a Romantic Times Career Achievement Award for urban fantasy, and she is the winner of the Pioneer Achievement Award. Elrod loves meeting readers at science-fiction conventions all over the country. She has two dogs—Sasha and Megan—and an incurable addiction to chocolate. She lives somewhere on another planet, but maintains a convenient citizenship in the state of Texas for tax purposes.